On winter solstice night, an injured man that seemed to be at death’s door arrived at a tavern in a village on the side of the Thames river. He fainted on arrival, thus the locals quickly called the village’s nurse and forgot about the bundle the man was carrying in his arms. They dismissed it as a doll. It was not. It wasn’t until the man had been tended to that people remembered the bundle, which upon closer inspection turned out to be a toddler of about four years old that looked dead. Upon thorough inspection, the nurse concluded that the girl was indeed dead, possibly from drowning, but after spending some time by her side, she realized that the girl was breathing once again. Was it a miracle? Local villagers thought so. The nurse, however, was confounded. This case defied the medical knowledge she had acquired throughout her life. Did she miss something important during her examination? She didn’t think so, and swore to get to the bottom of it. The story of how the dead girl lived became the favorite topic of storytellers. For many miles up and down river the story spread and that is how two families and a single woman came to claim her as kin. The first family to arrive at the tavern for the girl was the Vaughans—Helena and Anthony—, a couple who had lost their daughter, Amelia, two years prior in a kidnapping. They recognized the girl as theirs, at least the mother did, the father was not so sure. While the Vaughans were at the tavern, Robin Armstrong, a young man whose wife had thrown her daughter to the river before committing suicide two days ago, also arrived, with the intention of claiming the girl as his own. He had never seen his daughter but wanted to keep his options open. The third interested party was the maid of the parson in the adjacent village, Lily White, who claimed that the girl was her lost little sister, Anne. Lily had the weakest claim of all because of her age, which made impossible for her mother to have conceived the girl at a childbearing age. It was universally accepted that “the girl who lived again” was Amelia, the Vaughans’ long lost daughter. The family was together once more and they could be happy at last. Anthony Vaughan’s peace was a fragile one, for he had lingering doubts that the girl who was sharing their lives was actually his lost Amelia. Events eventually conspired to shatter their peace, but with so many diverging interests at play some questions remained elusive, like who was really this girl that everyone wanted so dearly to keep and raise as their own, and where had she come from? The only thing in common between Once Upon a River, the third novel by Diane Setterfield, and her previous works is lavish, old fashion storytelling. 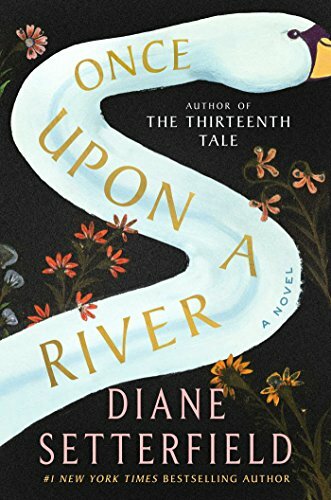 The river at its center lends a slow cadence to the story, like the bends and twists of the river, that give it a “classical” feel. This novel has echoes of M.L. Steadman’s The Light Between Oceans, because there is a “custody battle” of sorts at the center of the plot, but the similarity between both works end there. The story unfolds in the 1800s, the year is only mentioned once, and the only “modern” elements of the story are trains as mode of transportation, photography, scientific observations as ways to prove or disprove theories, and some Darwinian ideas accepted as some sort of conventional wisdom. Parapsychology seems to be in its infancy as well, as evidenced by a character in the story that is a cross between a medium and a therapist. Thus, the story unfolds in a sort of in-between state between the old world and the new, between convention and defiance, right and wrong, good and evil. The lives of the majority of the characters that populate this novel are ruled by natural cycles; most are farmers, cress growers, gravel diggers, boat makers, and part-time drunkards with a flair for telling tall tales. They feel at ease in a world of mysticism and folklore, which contrasts with some of the other characters, the fewest in number, who stand for progress and science, such as Rita (the nurse), and Henry Daunt (the photographer). Once Upon a River unfolds of its own accord, developing branches and sometimes going on tangents before going back to its core. I have to admit that I wished in some parts, especially towards the end, that the story had been more tightly focused, pared down a bit, but in doing so the spirit of the tale may have been compromised somewhat. This is not a conventional page turner, but it will involve the reader in such a way that he/she will find impossible to break free of the spell until the end is reached. Excellent capturing of this quite excellent book. Thanks, Judy. I struggled with the review for a bit. I read Setterfield's The Thirteenth Tale back in 2013 as the month's selection of the local book club that I attended at that time, and I had some of the same concerns about it that you have about this one; i.e., the plot needed tightening and it could have used a judicious editor. She obviously has a devoted fan base but I'm not sure I could ever be part of it. Yes, it takes a certain frame of mind to get used to her pacing. It was a bit slow towards the end. Great review and I completely agree. I had a few moments where I was reaching that point of thinking 'enough is enough' with some of the meandering - but I felt like the author must be reading my mind because she always changed at that point - like she was pushing the boundary. I loved the style and the mystery, it put me in mind of an older book where the deviating style and whimsical feel was more acceptable somehow. I LOVED your review. In truth, I didn't even know what I wanted to say until I started typing. Yes, there was a lot of meandering but I think it was a little bit on purpose to mimic the flow of the river, or at least I interpreted it that way, but you're right in suggesting that she may have been pushing boundaries. I did like it enough to be a strong four from the start, more I'm not sure. Thanks for letting me know about this one ... even about the slowness and the meandering. I read 13th Tale a long while ago and recall having some reservations about it despite knowing it was quite creative and I was glad to have read it. ML Stedman does have a pretty riveting custody case in her book! I liked that one. Great review, Carmen. I've just finished reading this book and I agree with everything you've said about it. I enjoyed it, but I did find it a bit slow at times too - although I'm sure you're right about the meandering style mimicking the flow of the river.